For a company that only sells one style of car, Caterham has a remarkably varied product line-up. It's impressive enough that four variants have made it over to the United States, but a quick look at the Caterham catalogue on the other side of the pond reveals a pretty sizeable range. Even when you take out the racing cars, it totals at no less (and rather appropriately) seven different variations of the same lightweight, Lotus-originated theme. And now there's a new addition to the Caterham Seven family tree, courtesy of the all-new 310 iteration. Though technically not a totally brand-new Seven variant (Caterham rather openly admits that it's derived from the 270), the 310 does have quite a bit going for it. The bump up in power by another 17 hp to 152 hp is quite a welcome increase, and the 310's shared underpinnings means owners of the 270 can send their car to Caterham and have it upgraded to 310 spec. 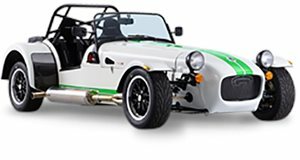 What really gets us excited about the Caterham Seven 310, however, is its positioning in the Caterham pecking order. According to official representatives, this new Seven is earmarked as the spiritual successor to the original, Rover K-powered R300: a Caterham that's considered by many to be the most beautifully balanced Seven ever made. As a result, we'd love Caterham forever if it decided to bring the 310 over to the United States. We already have access to the 270 on which the 310 is based, so it's not like the car can't be introduced to the US. Plus, we're certain that the devoted Caterham fan base in North America would love to take a Seven that's been inspired by the fantastic R300 for a spin. 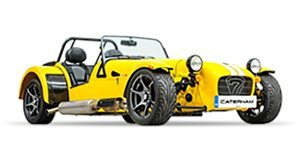 Factor in how relatively affordable it is (factory-built cars cost $33,000 when converted from British Pounds, with the 270 upgrade at current exchange rates setting buyers back $2,000), and we could see the Seven 310 going down incredibly well with Caterham aficionados in the States.